On Tuesday, embattled marine entertainment company SeaWorld announced that over the past few weeks one of their most cherished animals, Tilikum the killer whale, has shown signs that his "health is beginning to deteriorate." According to SeaWorld's veterinarian staff, Tilikum has become increasingly lethargic and shows signs of having a treatment-resistant bacterial infection in his lungs. While the staff continue to care and medicate him with hopes for the best, they are also focused on "managing his illness in a way that makes him comfortable and creates an enriching life." And what a life it has been. After being caught somewhere off the coast of Iceland in 1983, Tilikum has spent 23 of his estimated 35 years at SeaWorld. Over the course of his time in captivity, he's been linked to three human deaths, including the headline-making 2010 encounter in which he dragged 40-year-old trainer Dawn Brancheau to her death in front of a live crowd. 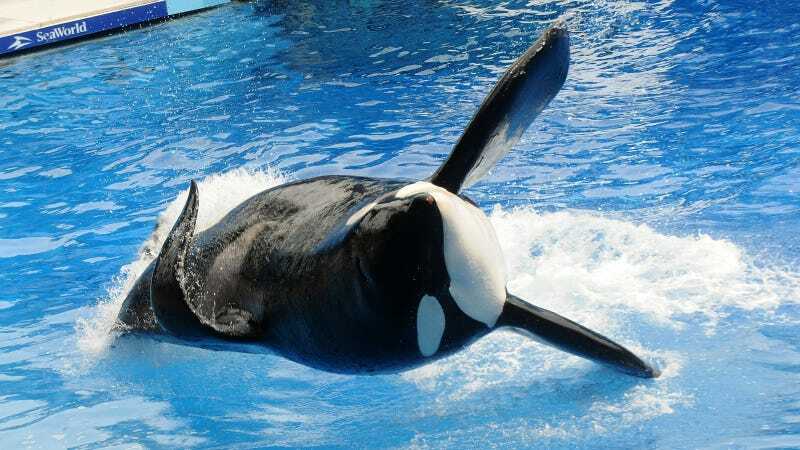 The rough spell for SeaWorld continues, as three whales have already died in the San Antonio SeaWorld over the last nine months, including a female orca named Unna, who passed away from a fungal infection. Seaworld continues to deny that the conditions of captivity are creating an environment of poor physical and mental health for these marine animals, but other wildlife experts and activists disagree. According to SeaWorld, 35 is near the high end of the average life expectancy for male killer whales.